Investing in Children, a children’s human rights organisation based in Durham working in partnership with children and young people to exercise their rights and participate in decision that affect them, has recently been awarded the County Durham Volunteering Kite Mark. 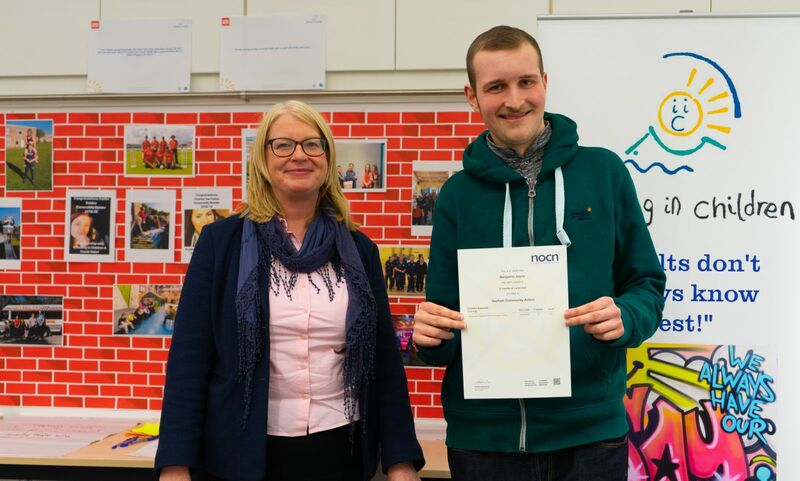 Photo: Abby Thompson from Durham Community Action presenting volunteer Ben Joyce from Investing in Children with their certificate at an awards evening planned to celebrate their Comic Relief funded volunteering project. Investing in Children creates spaces in which children and young people can come together, discuss issues and develop arguments through research, then support them to enter into dialogues with adults who have the power to act on their agenda. Achievement of the County Durham Volunteering Kite Mark which is facilitated by Durham Community Action demonstrates that Investing in Children meets standards to overcome barriers to volunteering and recognises the value of recruiting and retaining volunteers. The Kite Mark shows an organisation manages a volunteering programme where volunteers receive a high quality, positive volunteering experience. For more information on the County Durham Volunteering Kite Mark please visit the Durham Community Action website or telephone 01388 742040.